One year ago, the Flyers were two wins away from being 2010 Stanley Cup champion. Four months ago, the Flyers were the odds on favourite to win be 2011 Stanley Cup champions. Earlier today, they traded away both their captain and their leading goal scorer in separate deals, then signed a 31 year old goalie (with no playoff success to his name) to a nine year deal, paying him 10 million in the first season. The most shocking part of the whole thing? The Flyers may be a better team today than they were yesterday. – Their captain, and fan favourite. – Their perennial leading goal scorer. – A combined 130 points last year. – A high first round pick. – Highly touted prospect, Brayden Schenn. – A combined 76 points. – A third round pick. – A second round pick. – 11 million off the books. And now…for something completely different. Instead of the usual bullet point system, I’m trying out a sort of Point/CounterPoint format, tentatively titled “I hate this! !/I hate you!!”. The title seems appropriate since that’s what most of my hockey conversations boil down to. So, here we with the pilot episode of…. I HATE THIS!!! !/I HATE YOU!!!!! The Flyers needed a goalie, I get that, but according to everyone who matters, they were one step away from winning the cup (that step being a solid goaltender). So all they needed to do was make enough room to sign a Bryzgalov type and lock down everyone else for a couple of years and you’re set. Sure, they might have to move Matt Carle or Ville Leino but that’s a small price to pay to finally get a world class goalie. Instead, the Flyers go and their two best players for a handful of drafts and prospects? Ed Snider isn’t getting any younger, I thought the mandate was “win now, at all costs”, not “pick up some potentially great young talent that can come into it’s own as Daniel Briere and Chris Pronger get too old to be effective”. Yes, the Flyers lost their captain, yes, they lost their leading goal scorer and annual 40 goal threat, but at the end of the day these were 66 point players last year and in trading them, the Flyers gained so much more. In Bryzgalov they get what they haven’t had since Bernie Parent, a legitimate top-end goaltender. On top of that they managed to stock up on three great young hockey players and three draft picks (including a first rounder). You’re saying to yourself, “those three players can’t put up points like Richie and Carter” and you may be right, but they may not have to. Remember that Claude Giroux is only 23 years old, and JVR is starting to come into his own. 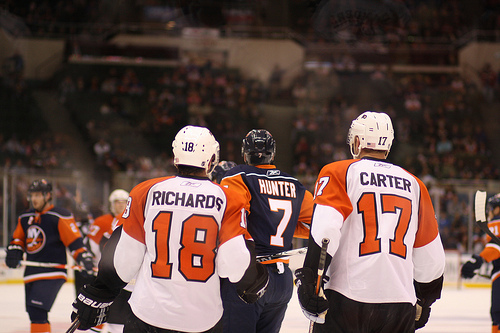 In this last post-season, these two had 13 points to Richards/Carters 7. Not to mention the whole idea behind getting a quality goaltender is that you don’t have to score as many goals. Yes the Flyers need some of these young players to continue their development, but the Chicago Blackhawks showed the Flyers a couple of years ago, you can win with young talent, if you manage it well enough. At the end of the day, the Flyers are younger, cheaper and they have a goalie.